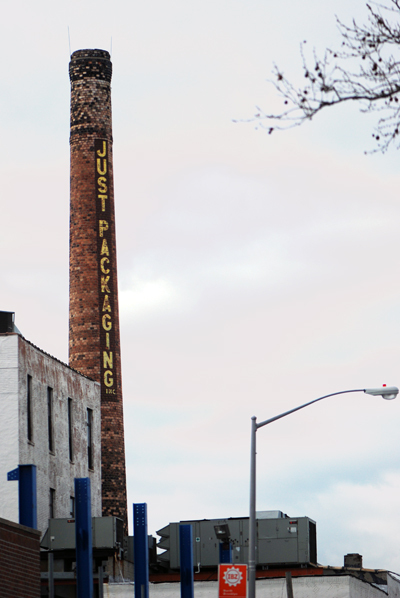 Just Packaging – Greenpoint, Brooklyn | Fading Ad Blog HAS MOVED! This entry was posted in Brooklyn, Greenpoint, Photography, Post-Industrial. Bookmark the permalink. The Just Packaging Co. began in 1985, repackaging products for a variety of industries and end uses. The company is now located in South Plainfield, NJ according to their website http://www.justpackaging.com. 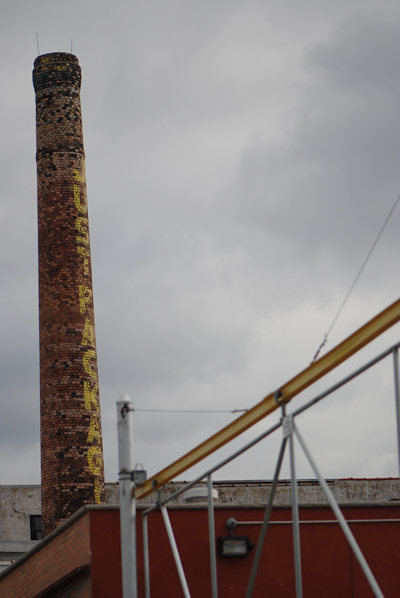 One of the tallest chimneys in the U.S. was built in the early 1900s in nearby Newark, NJ. The Heller & Merz Co. manufactured ultramarine dye for laundry bluing. The process emitted toxic hydrogen sulfide and sulfur dioxide gases. Nearby farmers had frequent claims for damaged crops. Hydrogen sulfide turned a house freshly painted with white lead to gray in a few hours. The solution was construction of a 350 foot tall smokestack. This allowed the company to operate until about 1949. After some additional research, I believe the original company at the Just Packaging site was the John C. Wiarda Co., a chemical producer. Wiarda founded the company in 1893 with $100,000 in capital. The first location was 259-273 Green St. but this site was destroyed by a fire on August 16, 1898. It looks like the plant was then moved slightly east to 371 Green St. This was a sprawling plant bounded by Green, Provost and Freeman Streets. The company manufactured bone ash fertilizer and a wide variety of organic and inorganic chemicals including aniline (for dyes), hydrofluoric acid, sulfuric acid, ammonia, epsom salt, copper carbonate, and soda ash. These operations would have required a tall smokestack to vent the toxic fumes and boiler soot. The company made sodium flouride which was sold to the U.S. Navy to exterminate roaches aboad ships. There is little information about the Wiarda Co. after 1921 so it probably went out of business around that time. The industrial recession in the U.S. in the early 1920s and this may have been a factor in the company’s demise.